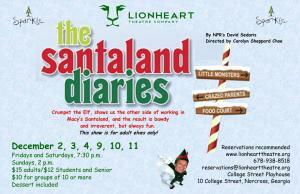 The Santaland Diaries is David Sedaris’ hilarious send-up of his brief, misguided career as a Macy’s elf. The show skewers our sentimental love of all things Christmas – the happy children, the spritely elves, the gifts, the good cheer. Sedaris’ character, Crumpet the Elf, shows us the other side of what it’s like to work at Santaland, and the result is bawdy and irreverent, but always fun. This show is rated PG 13 for language and adult references. Recommended for adult elves only.